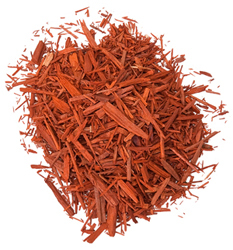 You are at:Home»Herbs»Pterocarpus santalinus Linn. Latin name : Pterocarpus santalinus Linn. Description : It is astringent, bitter, blood purifier, cardiotonic, constipative, coolant (mild), deodorant, demulcent, exhilarant, refrigerant, sedative and tonic. Useful in menorrhagia, leucorrhoea, spermatorrhoea, dysuria, allergic rashes, headache, jaundice, bleeding piles, hyperacidity, chronic cough, excessive thirst and hiccups. Also useful in anxiety and depression. Recommended Dosage : 500 mg to 1 g powder of heart wood.